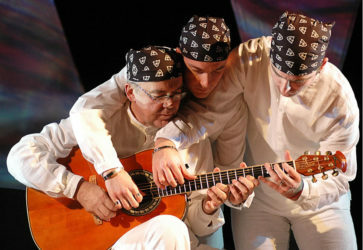 The Trio Balkan Strings (Zoran Starcevic & his sons Nikola and Zeljko) is a family of guitarists from Belgrade. Their sound is original and unique instrumental music, a fusion of Balkan elements: Serbian, Gypsy, Macedonian, Romanian, Moldovan, Bulgarian, Hungarian, Mediterranean, Greek, Oriental combined with jazz improvisation and classical elements. The result is original, unconventional, fresh and spontaneous music which is performed with energetic joy. The trio has performed at numerous festivals and concerts in the USA (Boston, New York, Chicago, Portland, Washington, Charlotte, Greensboro…), in Canada (Toronto, Vancouver…), Italy, Poland, Hungary, Turkey, Russia, Moldova, Slovenia, Serbia, Montenegro, Bosnia. In all these places they have won over a large number of fans. They have also given master courses and educational concerts for classical and jazz guitar students in both Europe and the USA.